Feeling peckish? Fear not, time travellers – the king has sent word to the finest food vendors in all the land to make sure no one goes hungry. The king would like to remind you that you are most welcome to bring food of your own to enjoy over the weekend. 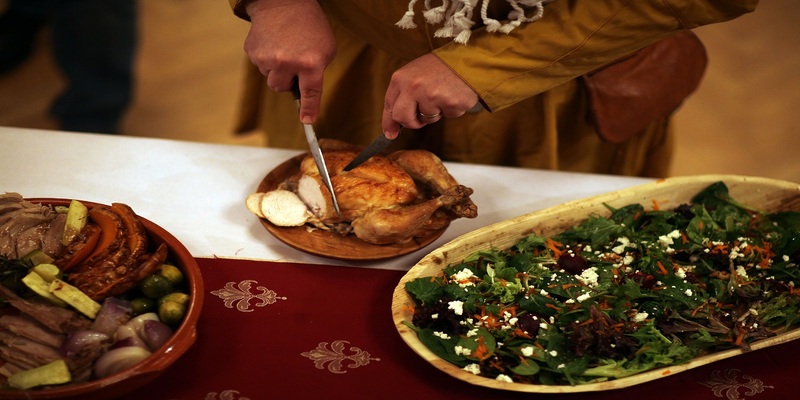 Enjoy a delicious feast of Authentic Medieval delights prepared by our master chefs at our Special VIP Enclosure next to the Joust Arena where you will have the opportunity to have the best view of the day’s program. Drinks from Two Birds Brewing will be available. This special experience will be at an additional fee to the ticket price and will be available for pre-purchase. Numbers will be very limited. Details will be announced soon. A hearty and authentic tavern menu will be served. Is there a medieval feast associated with the fair this year? If so, when and where is it held and when do tickets bed to be purchased, and how much are they? Hi Karen, we arent holding a feast in 2018 but we do have a Royal Court Expereince each day that includes a feast, you can check this out on the website.